An example of the offending feeble piece of parchment article. Here at Uncyclopedia, we do not wish to promote the practise of driving above the designated speed limit. This of course is highly dangerous: as every good driver knows, once a car exceeds 65mph, the speed barrier is broken, causing the vehicle to explode in a fit of spontaneous combustion. However, because traffic cops are such tightwads, they are constantly on the lookout for innocent motorists who serve as potential 'speeders'. 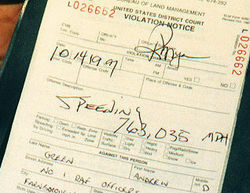 Although these motorists may be travelling at a completely reasonable speed (130mph), the typical police officer is required to pull over and fine at least fifty motorists per day in order to rake in the obligatory total of drug/beer/doughnut/prostitute money the police force needs to amount to keep in business. This, as one can imagine, is quite a hefty sum, so it is unsurprising to be pulled over by a policeman at regular intervals. That's why we have put together this handy guide to beat the feds and avoid receiving those irritating speeding tickets and fines. Plus! Now thickhead intercontinentally friendly! A quick note: as you may (or may not, if you are stupid) have noticed from reading the first two paragraphs, parts of this article have been vandalised. Please ignore comments with a strikethrough. Gatsos are delightful grey decoratively graffitid boxes utilizing special flashy thingies state of the art technology to trap any innocent motorist that happens to pass by. The burst of bright yellow light alerts a nearby sniper indicates to the DVLA that they should send a nice present for you through the post which demands immediate/prompt payment. Failure to do so may result in a Court Injunction. This, of course, is the result of the Government's highly guarded arrangement with the traffic police which ensures they receive their share of the public's life savings in return for keeping quiet about and turning a blind eye to the cops' perceived 'inadequacies'. Fig 1.1: Avoiding a speed camera. However, Gatso-related fines are extremely easy to avoid. The easiest way to dodge the wrath of the 'little grey boxes of doom' is to avoid them completely. In Britain, this is made simple by the AA's helpful Guide to Speed Camera locations. For those living outside UK, or are otherwise excessively lazy/skint/stoned to purchase one, memorise their positions along your planned route, before taking appropriate diversions through an adjacent farmer's field. Beware, however, of passing horses and dormant cowpats, not to mention barbed wire fences. Refer to the diagram to the right for guidance. If you are still thick unlucky enough to be caught, do not fear, as there are alternative methods which highlight the poor quality of the national Postal Service as well as the low intelligence of the police force's employees. Once the bill arrives through your letterbox, burn it. When the case arrives at court, the sole piece of incriminating evidence will be be destroyed. Because the DVLA are trapped in 1973, no computer records are kept, and the Chief Inspector type person will most likely have taped over the filmic evidence of the event in question with an episode of Coronation Street. You will be free to leave without paying a penny. If you are unfortunate enough to be caught by a speed camera, remember that the picture of your car is caught on film and emptied regularly rather than sent straight to the Police electronically. 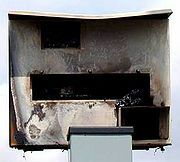 Forcefully exploding the speed camera with a handy missile should ensure that you don't get fined. For more help on spotting a Speed Camera, visit the Speed Camera official website. For further tips on avoiding a Speed Camera, visit Cabalamat's site. A traffic cop pulls over another unsuspecting motorist. As stated in the Highway Code, be ever vigilant as to police activity in the general vicinity of your vehicle. There are various categories into which this may fall, summarised briefly as follows. Each must be eliminated avoided at all costs. These are by far the easiest to spot and avoid. Distinguishable by their stupid hats stocky build, and often encountered frequenting local chippies and brothels (as customers, obviously). The experienced motorist will have no problem steering clear of them, as even if one does attempt to stop you by stepping in front of your car, taking them on a trip to Cop Roadkill City should see them off. Once they are on your tail, harder to shake off than the foot coppers, but still relatively simple to avoid due to their ageing panda Ford Fiestas. You should be able to lose any oncoming vehicle cops by travelling well within the speed limit in any car newer than a 1967 Mini Cooper Mk I and a very basic knowledge of local roads. Failing this, drive into an adjacent garage, multi-storey car park or local housing estate before removing the license plates. With no method of vehicle identification amongst the vast amounts of number-plateless cars, the visually-impaired police followers are, technically, screwed. If you are in Australia, you are much less fortunate as the Police force has deemed it necessary to invest in V8 Holdens, V8 Fords and boosted Ford F6 Typhoons for pursuit purposes. If you are driving a V12 Jaguar, you should have no problems evading the police as you can accelerate faster than they can. If not, the following technique can be used to dispatch them. For Ford vehicles, remind the vehicle of what Ford stands for: Found On Rubbish Dump. This will cause the police car to instantly teleport to the nearest tip, thus ensuring that you have an easy escape. For Holden vehicles, yell loudly at the vehicle that you are the managing director of General Motors Corporation and order the vehicle to explode. Because of their ties to General Motors, Holdens are hard wired to follow the command of the Managing Director of General Motors Corporation. Because the Holden doesn't actually check to see if you really are the Managing Director, it will follow your orders without question. Note: If a vehicle copper passes you at a high speed, or is oncoming at a high speed it is likely that he not coming directly for you, but may in fact be going for the new donut at Starbucks/Tim Hortons/Second Cup etc. An individual forgets to remove his thermal underwear. Notoriously difficult to evade, but easy if you know how (clue: sawn off shotgun and sunroof). Once a cop helicopter has you in its sights, the only thing one can possibly do to avoid them is to drive everywhere at night time. The chopper cops have thermal imaging cameras at their disposal, relying on them to find you in the dark. However, make sure you are not wearing any thermal underwear and they will have major problems spotting you. Thus, you will be able to speed away into a busy Tesco car park and blend in with the various citizens going about their night-time shop. Should your driving skills be inadequate in successfully evading any cop pursuits, resulting in what is technically termed as 'being pulled over', there are various methods available to the resourceful motorist which aid fine-avoidance. You: Did you see which way he went? You: Good, now let's not waste time hanging around here... let's catch the frigger. 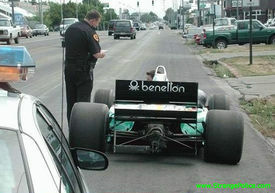 Cop: Uh, ok... let's roll. You travel in opposite direction. For more helpful info on impersonating celebrities, see HowTo:Be like your favorite Celebrity. You: Good evening officer. Is there a problem? Cop: You seem to have been travelling rather fast there sir. I'll have to give you a ticket. You: Oh, don't you know who I am? Cop: Huh? Never seen you in my life. You: I am John McCulloch, international rock star and entrepreneur. Cop: Never heard of you. You: Now do you recognise me? Cop: Oh yeah! You're that guy off the TV! Cop: I'll let you off if you give me your autograph, sir! You sign his autograph book and drive away before the starstruck cop realises. You: Good afternoon, officer. Would you like a cigarette? Cop: Why thank you, sir. You: How is it, officer? Cop, in spaced out trance, stumbles to side of road, mumbling insanities. You open driver's side window. You: Is there a problem, officer? Cop legs it back to patrol car. This technique will be much more successful if you are Female. Cop: Oh my GOD! I'm so sorry, I didn't notice you were pregnant. Cop: Let me just... hold on a sec here... men don't get pregnant! Cop: OK, OK, let me just radio for help. Cop runs back to patrol car. Cop forgets what the heck he was doing, and goes back to eating his chip butty. In some cases, the motorist may encounter a rare species of particularly intelligent or resilient police officer, resulting in failure of all the aforementioned methods, or have received a speeding ticket prior to consulting this guide. In these situations, the individual in question may be landed with a substantial fine. However, all hope is not lost, as there are still various measures which can be taken to evade the greedy clutches of the DVLA. A selection of these is detailed in the following paragraphs, and can be used in conjunction with each other in order to increase effectiveness. The most effective method is to contact the DVLA, preferably via their telephone service, to mention that you have just happened to have sold your car prior to receiving the speeding ticket. Mention that a certain 'John McCulloch' or whichever celebrity persona you chose to take on during method 3.2 (Don't you know who I am?) is currently in posession of the vehicle you were driving, citing the address of your local Councillor or the Prime Minister as the address at which the individual currently resides. Though this may seem obvious to the average uneducated motorist, bear in mind that the employees at the DVLA call centre are alienated workers, suppressed by the capitalist forces which rule over them. As a result they are likely to be highly gullible and believe literally anything anybody tells them. Therefore it is extremely easy to fool them into thinking you have in fact sold the car on. Avoid marker pens when creating home-made number plates. A second handy measure which can be employed by the motorist is to have a series of extra, alternative number plates stored in your attic or garage which can be applied to your vehicle whenever needed. These will be very useful in avoiding payments; when the DVLA send a team of hired goons round to your door, you can mention that the license plate listed on their computer is clearly different to the one currently attached to your vehicle. Warning: This method can be highly risky, as hired goons are invariably large, musclebound fat guys all too eager to punch out the lights of anybody that slightly displeases them. For this reason, ensure that if you have to resort to 'homemade' number plates they reach a certain standard of realism. Avoid taking a piece of cardboard and inscribing it with pencil or biro, rather opt for a laminated piece of paper and marker pen combination. This should be sufficient to fool the authorities, but for extra safety, attempt to keep the goons within a couple of feet of the vehicle in question. This method requires a certain amount of pre-planning. Be sure to contact the DVLA notifying them that your address is in fact the large, spooky house on top of the hill in the dark part of the town no-one ever visits. For added effect, speak with a slow, drawn out Polish accent when speaking to the assistants at the DVLA call centre, with a recording of howling wolves in the playing in the background if possible. In addition, sign any postal correspondance using human blood. DVLA workers are sure to 'chicken out' for fear of having their insides sucked out and announce that there must have been some mistake, picking some other address at random to divert the fine to. You are now suitably versed in speeding fine avoidance to prevent receiving tickets. Please remember that the Police Force are a sneaky bunch, and are constantly finding new ways to trick innocent motorists into stumping up their cash. So although you now share the knowledge of our fine-avoidance experts, always be aware that some techniques utilised by traffic cops are not listed here. Be sure to constantly check back for expert updates and more help in avoiding speeding tickets and fines.